According to Google Webmaster Tools, keyword stuffing is defined as “the practice of loading a webpage with keywords or numbers in an attempt to manipulate a site’s ranking in Google search results”. They go on to say that it “results in a negative user experience, and can harm your site’s ranking”. So, how can we write good content that our blog readers will enjoy while not getting penalized by the search engines? Bottom-line, it always comes down to writing naturally, as if you’re having a conversation with your website visitors. Think of some of your favorite blogs. Why do you visit them? Do some of them make you smile? Make you feel more confident? Teach you something that you didn’t know? Some of the best advice that I read when I started to blog was to “find your voice”. Have you found yours? Thank you, thank you, thank you. Google is getting smarter and smarter and these techniques will soon be overshadowed as websites are rewarded for articles that are written for reader enjoyment and flow “naturally.” If the content is written properly (for reader enjoyment and information), keywords will also flow naturally in the article and Google’s algorithm will pick up on this and rank accordingly. Thank you for sharing. You’re welcome Nick. I’m glad you found my article interesting. It is a relief to hear that Google is trying to reward quality content. I’m a big fan of Matt Cutts. He seems to be genuine to me. When it comes to keywords I really like to keep it simple and the way that the humans would understand. Sometimes it just works well and sometimes it does takes a lot of offpage efforts to get it ranked properly. Hmmmm….. a lot of “offpage efforts to get it ranked properly”. I’d be interested in hearing what it is you do. Are you talking meta-tag descriptions? No actually the offpage part. Title, metas, content, sidebar if any, footer etc is done once then maybe it needs tweaking as I gather up more data from google webmaster tools and all. In offpage side I have to support all my onpage efforts with lots and lots of relevant backlinks with proper related anchor texts to make it look natural. It used to be quite simple in past it is still bit simple as far as Bing is concerned but for google now anchor text variations is becoming a headache. Thanks for the explanation Keral. I’ve never heard that task referred to as offpage before to refer to what we do to promote our posts. That a good term for it though. Hi Sherryl, indeed a very interesting thought. Sometimes it’s not that I do it intentionally (to stuff the keywords) but because of my writing style that keeps on stressing and using the words repeatedly, just to make my points clear. But maybe after reading this and watching the videos by Matt, I think the term “naturally” should be the main focus right now. And yeah, that is definitely true and makes sense. Sorry for the late reply! A mix of keywords and synonyms can work nicely for SEO. The key is to make it sound natural. If you write for your readers, you should be fine. You wouldn’t want to repeat either your main keywords or synonyms for them. If you’re at a point where you don’t know what terms people are searching on to find your topic, that’s always a good time to do some research with a keyword tool such as Google’s external keyword tool. I can’t say I have found my voice yet, but I am working on it. I think it is a work in progress. We forget that we want people to read our blogs and optimization should come with the content without stuffing it with all types of keywords. Maybe write more blogs and use two or three keywords per blog. Google likes a lot of pages within a site as it shows that the site has merit. Arleen Harry recently posted..How do you turn Insomnia into Branding? I think being a work in progress is a good idea. It means that we’re learning and growing from our experiences. Focusing on a main idea for each article is a good idea for both the search engines and our readers. I think the exception to that rule is on recap type posts but even then, we should keep the focus on topics that our readers generally expect to find on our site. Thanks for dropping by and joining the conversation. I’m guilty of this keyword stuffing issue in blogging sometimes, especially when I ran out of synonyms or related words. Although I find it beneficial to use synonyms in my blog, there are times when it reads unnatural and not smooth. This is especially true when it comes to SEO. When I first started blogging, I didn’t worry about SEO at all. Even now, I concentrate on writing content that I hope my blog readers will enjoy and/or benefit from in some way. Honestly, the traffic that most of us get organically from the search engines isn’t (usually) that valuable. That traffic usually has a high “bounce rate” (meaning they quickly leave your site), and spend very little time on a page – which means they’re unlikely to convert (whatever it is you want them to do) and they probably won’t be back. Most of us believe that it’s more beneficial to concentrate on building relationships with our readers through our blog and through social media sites. After you start getting visitors and your readers seem happy, then, you can try to keep SEO in the back of your mind. I don’t think keyword stuffing helps in the long run, it might help you get away in the initial days but with the passage of time visitors understand your trick. It is then that you face the consequences, and these are for real long, you can’t get rid of them so easily. No one should risk incurring the wrath of Google by stuffing keywords. Using synonyms is a great way to help avoid that problem – as long as it sounds natural. Thanks for dropping by and taking the time to comment. Mostly all bloggers have started stuffing their blog posts with keywords only, and they no more worry about the quality of their post. But this is not going to help them in the long run, as the number of visitors will start to decline and slowly and gradually, all their efforts will be in vain. That’s very true Bryon. There are so many sources of information online now that unless our blog posts engage our visitors, they’re gone and most likely won’t be back. Hi Sherryl, I try not to stuff my articles with keywords to the extent of suffocation. Rather I try and keep my content flexible and easy to read, so that the readers don’t feel that the article was not useful at all but just a way of promoting something. I just checked out your blog post and you do a good job of writing an article that does not read like a promotion. One of the best pieces of marketing advice that I ever received was to always keep in mind that everyone listens to the radio station WIIFM – “What’s in it for me?” – We have to add value in some way. Great post Sherryl. When I write, I search for synonyms rather than repeating words constantly. Articles should be written naturally and keywords should be stuffed in proper places. Hi Sherryl, Yes, I struggle with this. I try to write naturally as I’m more interested in pleasing my readers than Google. But like Ray, I often write instructional articles where using a keyword repeatedly is necessary to explain the steps clearly and without confusion. When I first started my blog, I tried to submit my articles to Ezine, but I had to edit them dramatically because of Ezine’s restriction on having a keyword appear more than three times. I know Google can’t read every article that appears in their search engine, but I wish there were a better way for them to separate the wheat from the chaff. I’m with both you and Ray on that one Carolyn. In some posts, it looks like I’ve stuffed the post with words like WordPress. I don’t think there’s any good way to handle it. As I mentioned in my reply to Ray, I don’t know if it helps but I avoid repeating those words in my meta tags. I figure that they’re in there enough already. So, I try to avoid using them there and in my heading tags. Hi Sherryl, the answer to the question you asked is NO. This is so because I have started blogging recently, and I think everything takes time. I too need to let my skills improve, then only will I be able to give a positive answer to your question. I’m sure you’ll find your voice in time Harry. If you’re on LinkedIn and you’re looking for a support group, you may want to join the “Bloggers Helping Bloggers” group. It’s a very active group of bloggers of all levels of expertise. The main purpose of the group is to help mentor and support each other. (You’ll find lots of newbies there as well as seasoned pros.) I’ve personally become friends with several of the members there. Writing how you speak to friends helps you avoid keyword stuffing, for you rarely pepper your conversation with keywords, right? lol….write like you speak, feel natural and write in the same manner. If you read your posts out loud truth serum flows out. Quickly. Love the insight here. The best thing I ever did was to refrain from using SEO for a while. I released on some targeted traffic but I learned how to write naturally. After writing in this manner for months I could naturally add keywords without sounding awkward. When I first started blogging, I paid very little attention to SEO. I would just write. Then, when I looked at my article, I sometimes had keywords and sometimes didn’t. Once I got in the habit of tracking my posts and my SEO data, I was able to just naturally add keywords too. For me, I think it was a matter of learning what my readers wanted to read about or topics they wanted to discuss. Once I figured that out, it was as you say, speaking to friends. Thanks for dropping by. Rightly pointed out that keyword stuffing can invite Google penalties. I fail to understand why people do that in the first place. It might help get some quick results in the short run but is surely detrimental for the overall long term health of the blog. I still remember way back when car companies would stuff their meta tags with keywords from competitors. For example, you would search on a word like Buick and end up on a site that only talked about Fords. Now, that was amazing. So, SEO continues to evolve. When you think about his advice it comes down to common sense and understanding your audience and visitors to your website. Using synonyms can be helpful especially if you have international visitors or readers of your blog. I just spent quite a lot of my time delving into Google Analytics and found some interesting things about the keywords but also how to improve various aspects of my site. That said half the battle is understanding what the Analytics terms actually mean and how they play a part in the overall picture. It does come down to common sense Susan. The message from Google is to write good content that our readers enjoy. It’s about time. It’s amazing what we can learn from delving into our Google Analytics. Good luck improving your site! One of the things that bugs me about most SEO tools is that they insist that you put the key word in the first sentence for best SEO, but for the best read its good to have a little preamble or personal story to start with. I lie to tell a story and keep SEO in the back of my mind, making sure I don’t use the same words over and over make for good writing AND good SEO. I’m the same as you Heather. I try to incoporate some of my keywords in the title and as long as they’re in that first paragraph, I’m okay with it. 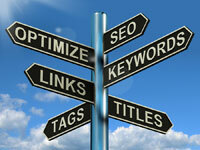 I have noticed that using keywords in heading tags has helped me quite a bit with SEO. When I first started blogging, I had no idea that breaking up your text with headings could help but it really does. When we format our text as headings WP, inserts HTML code that signifies to the search engines that this text is important. I’m in the habit now of always using them. Thanks for dropping by. I never do keyword research and all other SEO stuff on my blog, I always try to be natural, and that’s why in every Google animal updates my blog traffic remains same. It’s a good thing to do a keyword research but sometimes we do a lot and get penalized. Thanks for weighing in on this Nishant. My share of Google search traffic has been steadily increasing since the bird updates. I can’t prove it but I believe that it’s partly due to having implemented Google’s authorship. I think that having my profile pic showing up in the search results (along with my efforts to be active on several social media sites) is working in my favor. So, social media is working hand-in-hand with SEO. Its true, Google authorship surely improves your rankings, and using Google plus also improve your rankings, more plus one on your post means better rankings! Who knew that Google actually has a “synonym team!” I think it’s just plain good advice to write naturally and not worry about artificially stuffing one’s posts with unnatural words. They stick out like a sore thumb. Cheers & Happy Sunday. We have to worry about keyword stuffing more now that’s for sure. I still believe that if you write for your readers and it sounds naturally, you should be okay. I know there are those that purposely stuff keywords, but I also believe that sometimes it’s not entirely intentional. I write a lot of tutorials and it is pretty easy to sound repetitive. Others may write a much smaller slimmed down version, which can result in less repeating. I like to be as detailed as possible with each step because not everyone is experienced. There are a lot of beginners that need all the details. Of course it’s a long and tedious process to write them up, and it can result in what would appear to be keyword stuffing, but I like writing them, and if Google thinks some of them are a little too much then that’s OK too. I will definitely think about the thesaurus synonym thing though. I do try to remove some of the repetitive words if I can, but sometimes I just can’t or it won’t make sense. Next time I write one with a lot of similar words I’ll try to remember this. Thanks for the suggestion. That’s a great point Ray. I’ve run into the same problem myself. Sometimes, there’s no getting around it. There are some words where the synonyms are obscure and they just wouldn’t sound natural. I don’t know if it helps appease Google or not but what I try to do in that case is not also repeat those keywords in the meta tags. Sherryl — I hadn’t seen this video from Matt Cutts who always has interesting things to report about Google. I was glad to know Google is OK with synonyms as long as the content doesn’t seem forced or artificial. Once again, write for the reader and not for Google. I completely agree with you that we need to write for our readers. It’s also good to know that we can potentially generate some new traffic (and hopefully more loyal readers) by remembering to write using some of the terms that people are searching for – as long as it makes sense and is natural of course. Thanks for dropping by! Overusing keywords is one of the major problems I see with most blogs. With on page SEO in mind, most bloggers stuff their posts with keywords and the posts usually are gibberish – not sure how they publish such posts and hope to be ranked higher in SERPs. Even if they rank higher, the incoming traffic is going to leave right away. And, using synonyms is a great “hack” to this issue. While keeping the post readable and useful, one can also do some “natural” on page SEO! Thanks for dropping by! A lot of bloggers do sabotage their posts by trying to write for the search engines. It’s a shame really. Sometimes I wonder if they read what they’ve written. You raise a very interesting point Richard. It wouldn’t surprise me if Google did take into account geographical differences. If they don’t already, it wouldn’t surprise me if they do in in the future. Maybe if I get bored sometime, I’ll do a little more research into that. Thanks for sharing your insight! Good article, Sherryl!! Personally loved the example in the article you circulated about how BMW’s head office in Germany got punished by Google for keyword stuffing. There are far too many people, and companies as I wrote above, out there that are doing everything they can to trick search engines. When you land on such a page you notice it swiftly and puts me off. Write good articles for your readers and include keywords, for instance in the ways you suggested above. I had forgotten about that article Catarina. That would have been a nice link to include. It’s amazing to me that a company like BMW would risk incurring Google’s wrath like that. We definitely need to mix it up a little. No one wants to read an article with the same keywords over and over again. It definitely helps to make our content sound natural. Thanks for taking the time to comment Evan. It’s always nice to see you here. Previous post: Is Organic Search Traffic from Google Important to You?